This dish is probably called 'Mallige Idli' since it is as tender as the flower named 'Mallige' (Jasmine). For most South Indians, nothing can be more satisfying than a plate full of these Idlis for breakfast. Soak idli rice and urad dal separately for about 4 hours in hot water. Grind urad dal into a very soft batter along with little water,set aside. 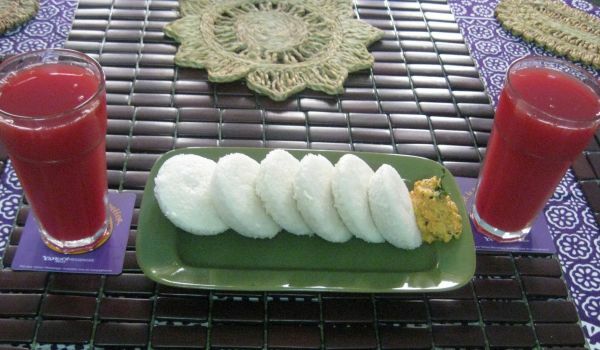 Now grind idli rice also into not very soft paste along with cooked rice, poha and sour curd. Combine urad dal paste with idli rice mixture. Add salt to taste,mix well. Place it in a hot place overnight for 10 to 12 hours for fermentation. Now pour batter into idli stand and steam cook for about 15 to 20 minutes until done. Let the idlis cool for few minutes before taking them out. Mallige Idli is ready to serve.